Reminiscences of John Ching | Launceston Then! His memoirs written in 1883 and from a transcription by Jake Jackson. Launceston has a history of which her sons may be proud, having for so many centuries held a good position in Cornwall (the seat of the Duke of Cornwall in his stronghold called Castle Terrible) as the county town, the assize town up to 1838, and as giving seat in the Commons House of Parliament to two Members, and the Borough of Newport in St. Stephens adjoining also returning the like number of representatives, so that four Members were sent up from two small constituencies, giving the same number as the City of London at that time possessed. It is not the purpose of this paper to express an opinion on the anomalous position of such unequal representation, no one can deny the need of the Reform Act of 1832. It might not be out of place to state that these two Cornish Boroughs were entirely different in their constitution; Dunheved, alias Launceston, sent two Members by the voices of eight Aldermen (who were elected for life) and a few Freemen (also life members); at this time there were about the same number as the Aldermen. The Borough of Newport was a “Scot and Lot” or “Potwalloper” constituency, the word Wallop being the Saxon word for boil; any man, therefore, boiling his own “pot” was a voter. In other words, every householder had a right of the franchise. There was no register of voters kept; the name being on the Poor Rate showed who were householders. I never remember hearing of any contest in Launceston or Newport up to this period (1832) during the present century. At the time of which I write, there was considerable excitement throughout the country. The Catholic Emancipation Bill passed in 1829 amidst most bitter feeling on both sides; the cry of reform in the representation of the Commons House was growing more and more serious; the death of George IV, and the accession of William IV (“the sailor King”) gave great impetus to the movement, and, after a great struggle, the Reform Bill was passed, and Launceston may be said to have lost three Members of Parliament out of four, and the enlarged constituency sought, on either side, to retain the one Member that was left. The whole of the year 1832 was one of struggle and excitement. The Whig party started a weekly newspaper called ‘The Reformer,’ the Tories also brought out their paper, styled ‘The Guardian.’ The entire contents from week to week was the upholding the faults and shortcomings of each party, and at last the personalities became so great that the leading men of each side signed a requisition to the editors to suppress further issues, and they ceased their publication. It was many years before the angry passions stirred up in this contest were allayed. The candidates for the seat of the Borough, with its enlarged area, were Sir Henry Hardinge, K. C. B., and Mr. David Howell, the owner and occupier of Trebursye (within the Borough area). At this period the police arrangements were of a simple character. Four master mechanics were sworn in as special constables; a shoemaker (Rogers), ropemaker (Grylls), blacksmith (Gibbon), and carpenter (Tapson). They were never on duty, and I think they were paid a trifling sum annually, and received fees chargeable on any case being heard by the Borough magistrates. There were no days set apart for holding Petty Sessions. Any case requiring adjudication was heard without delay, and the Mayor – more frequently alone than is the case now – held an enquiry, and passed judgment in accordance with the law. But there was a Court of Justice called the “Law Court” which held sittings twice a year. 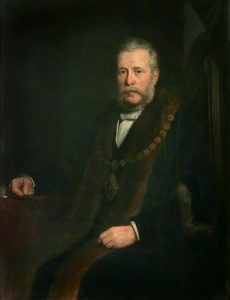 There was a Recorder of the Borough, the Duke of Northumberland, who appointed a Deputy (Christopher Lethbridge, Esq., and his son, John King Lethbridge, Esq.). The Mayor and Justice, with the aid of the Deputy Recorder, presided at this Court when the jail delivery was made; the Deputy Recorder (being a lawyer) passed sentence on the prisoners. There was a Grand Jury, composed of the principal tradesmen, who met on the morning when the Law Court held their sitting. They made presentments of anything they thought would be beneficial for the town. The punishment inflicted on prisoners found guilty of petty larceny was frequently of a corporal kind – that of being publicly whipped. This was deferred for the next Saturday (market day), when the culprit was stripped to the waist, and placed behind a cart with a horse attached, and his hands tied to the outside rails. The operator was the Sexton in my early recollections, and, after his death the Town Scavenger. The first strokes were given outside the Town Hall (on the present site of the Corn Market, 1882). The cart moved on, and at the bottom of Broad Street stopped, when a dozen more strokes were administered. There was a public dinner on the evening of the day on which the Law Court was held, when all who pleased might join. The Corporation and Deputy Recorder, the grand Jury, the Attorneys, and others came, and this was a most pleasant meeting, and brought all parties together in amity and friendship. Many improvements were suggested and carried out as a result of these gatherings. The public never enquired how such matters were to be paid for. The Mayor for the time being issued the orders, and, a few weeks after he had retired from office, the Corporation met, the bills were produced, examined, and paid. The Borough rents were never sufficient to meet expenditure. This system continued until the Municipal Reform Act, passed in 1835, when, on the 28th December in that year, the burgesses elected twelve men into the Town Council, and four Aldermen were at the first meeting after selected to make the number, authorised by this Act, of sixteen. As I have not kept a diary during the early period to which my paper refers, I must trust very much to my memory, and that as we all know from sad experience is often a failure. 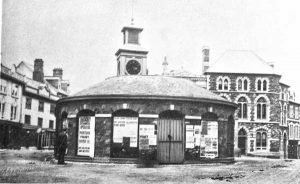 As I have resided in Launceston from birth (1809), only absent for my education in London for eighteen months, and again for improvement in my business experience for two years, I can say that from 1831 to the present time my life has been spent in my native town. If I treat of the state of the town in its social, political, religious, educational, and business conditions, great alterations will be manifested, and I hope, much improvement. As regards the social habits of the higher and lower classes, I should say that with reference to the former, there was a great amount of hospitality shown. The custom of giving dinner parties were frequent, when the cost of entertaining was considerably increased by the demand on the wine cellar. A bottle per man was a moderate computation, some in Launceston even now can testify that this was often exceeded. Of course it was a joke but someone asked, “What was the qualification for an Alderman’s gown?” The reply was to eat three plates of venison, and drink three bottles of wine!! Well might the Latin motto be applied to such bon vivants; “Implentur veteris bacchi pinquisque ferinae” (they are filled with old wine, and rich food, or venison). The ladies frequently had tea parties at 6 p.m., and where this was the only meal, the uninvited and irreverent termed them “tea and turn-out parties.” As this was before the day of gas, and the street oil lamps shed and imperfect light, the family lanthorn, of considerable size (4 square glass), was used to light the ladies to their homes soon after 10 p.m. Needlework, knitting, and such like occupied the evening, the elders indulging in a rubber of whist, casino, Pope Joan, etc. The political importance of the old town may be considered very considerable, seeing there were two members for Launceston, and the like number for the other side of St. Thomas River. I have myself seen four Members for Launceston dining at the White Hart with their constituents after a General Election, when the scenes of noise, confusion, and strife were discreditable to a civilised community. Beer was drawn into an open space outside the Town Hall in hogsheads, and given away in jugs to any who did not mind the struggle in getting it! Of course, many a fight was the result, and ill-feeling prevailed and continued long after. The sin of drunkenness was then thought lightly of, there was no such word as “teetotalism” at this period, nor any temperance societies to show a good example to those who were over-indulgent in their liquors. The religious bodies were the members of the Church of England, the Wesleyans, and the Congregationalists. The services in the first-named were morning and afternoon only. Both Nonconformist chapels had, in addition to the morning and afternoon, an evening service, to which several Church families went. My own parents rented a seat in Castle Street Chapel, and I could name others who did so. The Church was not opened for regular service during the week, except for saint’s days, until 1837 there had not been an evening service in the Parish Church. The educational advantages were few; the Grammar School, formed in Queen Elizabeth’s reign, then on the Higher Walk, the present building being “razed” to two stories (sic.) when the school was removed to St. Thomas Hill. Here Latin, Greek, and Hebrew were taught by a Master of Arts of Oxon or Cambridge, and the commercial instruction conveyed by the master and assistants. There were two commercial schools, the one at Belle Vue (below) by Rev. Richard Cope, and one of a cheaper class, a school in Back Lane (Tower Street). Belle Vue House in Western Road. There was a school in St. Stephens Hill (Mr. Rogers the master), to which many Launceston youths were sent, the master having a reputation for turning out his pupils as good writers. There were few families, professional and tradesmen, who did not send their sons to some boarding school to complete their education. The butcher’s stalls were in the High Street, the old shambles (the old shambles was the area behind the modern day Barclays bank) , and London Inn yard . The butchers had no shelter, the stalls occupied the narrow footpath, and they sold in the street. The Butter-Market (not to be confused with the later building in the square) was at the top of High Street, outside Mrs. Pode’s eating-house, the farmers’ wives standing close together, with baskets of butter on their arms or resting on the pavement. I don’t know when the alterations took place, but the weight of a pound of butter was in my early recollections 18 ounces. I remember hearing the vendor asked if it was 18 ounces, and the assurance made that it was “full weight.” The wheel vehicles were very few. The farmer of the wife, or both, rode on horseback. The animals were practised to a pace called a jog-trot, or “butter and egg pace.” This was continued all the way, up hill and down dale, the content of these baskets were too fragile to bear a rough trotting horse. The farmer and his wife often together, the latter on a long square seat, fitted on the back of the man’s saddle, and called a “pillion.” When two females rode in this fashion on (sic.) behind a side saddle the term was riding “jollifant.” The market was continued to a very late hour; in fact, as long as the butchers had any meat unsold, as was too frequently the case, and the Sunday morning saw them busy in disposing the meat in the village where they resided. It was quite a common practice for a butcher, when they had a “bad market,” to pack off large quatities of meat, and send it to the farmers from whom they had purchased the animals; this was not agreeable to the agriculturists, but as the beasts were not paid for, they had to growl and bear it. The price of meat was much less than it is now: beef (best cuts) 5d. to 6d. per lb., eggs 40 to 50 for 1s., potatoes 2s. 6d. for 140 lbs. weight. The quantity of corn brought into the market was very small. The bulk that was grown in the district was drawn to Tavistock and elsewhere. There was a toll on corn by the lessee of the market, who had a dish that held the prescribed measure and every sack was tolled in this way. The principal tradesmen considered this import acted prejudicially on the market, and by arrangement with the Corporation, a subscription was made every year, the sum paid to the authorities, and the market made free. This acted beneficially, and after a few years the Corporation assented to the abolition of the toll on grain, only exercising the right to collect one day in the year; this was not long continued. The Market Act, 1840, brought a new scale of charges into operation, and corn has not been tolled since. This is my belief, speaking from memory. The local fairs were six in number. These were entirely held in the streets, when the cattle (for there were no sheep brought in, or scarcely any) were placed in the streets, and from the Tower to the outside of Southgate, High Street, Broad Street, and Westgate Street were packed. At the largest fair on 17th November, called St. Leonard’s Fair, the whole town was a crowded mass of bullocks and dealers and men in charge. The selling began early in the morning; scores of bullocks were sold by candlelight. I have heard of 1,700 head of cattle being brought in for sale on this fair-day. The number of professional men were about the same as now. In the law were Lethbridge, Son, and Gurney, P.C. Hocking, John Darke, Pearce and Lawrence, and Richard K. Frost. In the medical: Dr. Rowe, Brendon and Patch, Dr. Pethick and Pearse, J. Ford Smith. 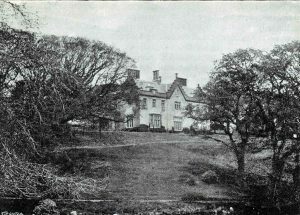 The Launceston Bank. William Harvey was, I think, the only residing banker, but that on market days the East Cornwall Bank and the Tavistock Bank sent representatives to transact business with their customers. The industries were the woollen factories at Newport and Newmills. Tresmarrow Quarry had ceased to be worked vigorously, the quality of the stone for roofing and other external work being found a perishable article probably from the working being too near the surface, where the atmosphere has great influence. The building trade was well represented by William Burt, of Newport, who deservedly held a high reputation for the excellence of his work, his masonry being especially good, and to this day you hear the remark; “That was old Mr. Burt’s work, and you may be sure it is thoroughly well done.” My experience shows me that building is of an epidemic character, one man begins, and others follow. 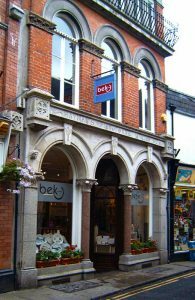 At this period (1832) there were many improvements in rebuilding houses, and making the shops of modern construction, of good height, and plenty of light from large windows. At this time the new road from St. Thomas Bridge to Broad Street was undertaken, and a name just referred to – William Burt – should not be forgotten in connection with this great improvement, as he was one of the principal promoters in getting subscriptions to defray the cost. The road passed up a narrow, green walk, or lane, under the Castle Green ramparts, not much frequented, and where the present Western Road passes there was a public footpath with stiles, terminating where the Launceston Infirmary now stands (the present day offices for Potter, Baker). This path led through the Castle Green under the existing arch at the Western end. This path led through the Castle Green, under the existing arch at the Western end. Here there was a stile and gateway for wheels to pass, but the wheel entrance to the Green and the jail was by Castle Street. The prisoners were brought from Bodmin at the Lent Assizes in ordinary vans, and passed under the Eastern arch to the jail in the Castle Green. The first great blow to Launceston’s prosperity was the removal of the Assizes to Bodmin. The reason for this was the position of the town, so far to the East of the County, and where the bulk of the population resided. The Judges and the gentlemen of the long robe were very adverse to going further West, the distance from Exeter was over 40 miles, and in the days before railways were constructed, this journey was one of 5 to 6 hours, the change of horses at Crockernwell and Okehampton causing much delay, so that naturally those attending from the East had a great aversion to cross the long 22 miles to Bodmin, but, as they had no voice in the decision, the removal took place. It is almost impossible to conceive the loss the removal of the Assizes was to every householder, for it was the practise by everyone who could do so to let their best apartments to the barristers and solicitors, with their attendants, who paid a handsome sum. The leading barristers engaged their lodgings from year to year, so that they might be sure of the same on their annual visit. I have heard it estimated that £2,000 was circulated during this period. This included the expenses of painting, papering, and improving the appearances of several properties. The Judges were always in private lodgings. The High Sheriff of the county always provided for the Bench with this accommodation, for which he paid £50 for the whole period the Judges were in town, whether one day or six. When the sentence of death was passed on any prisoner they were left for execution in the Castle Green, the gallows being erected on a slight mound in the centre of the Green. I remember one man from Stoke Climsland hanged for sheep-stealing; others that died by the hangman were for murder. The unfortunate man from Stoke, after hanging the usual time, was cut down, and I well remember his own father at the Westgate Inn waiting for his son’s body, which he afterwards took away in an open cart, followed by a crowd of onlookers. The widow of this man frequented Launceston market long after the execution of her husband. The rope used on these occasions was eagerly sought after, and disposed of to persons afflicted with scrofula and other diseases. IMPROVEMENTS TO THE CASTLE GREEN. The County Jail stood at this time nearly within the present high railings enclosing the walks from the keeper’s lodge. There was access to the Castle, the Jail and Castle Green by a path 5 feet wide from the Castle Ditch (or Dyke) opposite the back entrance to the Exeter Inn. The ruins were quite open on all sides , and the Deputy Constable derived a small income by letting the Castle area for pigsties, stables, gardens, skittle alley, etc., to any person requiring such accommodation. At this time the “ramparts,” as they were called, were clearly marked around the Castle Green, one part in the centre was easily mounted by the young, who thought nothing of broken necks or limbs. When the walk was made, as it now is, this one portion was removed. 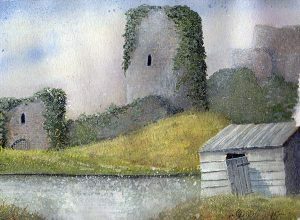 The Keep of the Castle was daily used by the schoolboys as a playground . The ascent had no regular steps to ascend by, a worn path, with projecting stones was the only approach to the castle itself. There was made about this time an entrance to the Castle Green by a walk, with broad flight of steps, from the Little White Hart corner (Leonards Corner) through a garden belonging to Mr. Penwarden, and passing the most picturesque of the outer ruins, called the “Witch’s Tower.” This ruin stood in sight of the White Hart Hotel, and was much admired by all. A most violent storm of wind overthrew it, but the making of the new road from St. Thomas, and which was then in construction, was considered to have assisted in the catastrophe. When the ruins were removed, many old coins were found. It may be though not inopportune to say something about the great alteration in the Castle Area, though it was a few years later in being carried out. The Duke of Northumberland was then Constable of the Castle, and, being most anxious to preserve the grand old ruins from more rapid decay that time alone would produce, directed the enclosing the entire space around the Green, and down to near Miss Pearse’s present garden in the St. Thomas Road (this would be near the rear of Eagle and Lawrence House). This was a very heavy job: the masonry is a standing testimony to Mr. William Burt’s excellent work. The laying out of the grounds around the Castle was entrusted by Mr. J. Lethbridge Cowlard to the late Mr. Tavers Lawrence, and it was very fortunate that there was no one so capable for the work resident in Launceston. Mr. Lawrence was a landscape gardener born, and this work was his chef d’ouvre (sic.). The restoration of the ancient ascent, and restoration of parts of the old side walls, guarding the long flight of steps, and preserving all the old outlines, is considered by skilled experts as highly creditable to his skill. There was a story current at that time that when the cost of all this work, occupying scores of men, both stone masons and labourers, for many months, came to be presented for payment to the Constable, he expresses surprise at being called upon to pay something like £5,000 for it! But, being a practical man, he knew of one architect who had skill in estimating what such work should cost, and he sent him down to examine thoroughly the whole that had been done, and without naming to him what the cost had been, he was to assess the amount that such a job would cost. It was said that the Duke’s satisfaction was great when the report came, showing a larger sum might have been charged than had been demanded. The Town Hall at this date extended nearly as far as the Western end of the present White Hart Hotel, the street was narrow, not being above 20feet in width. There were two Courts for the administration of justice: the Western Court called the Crown Court where the criminals were tried; and the Nisi Prius Court where the civil cases were dealt with. There were two dwelling houses with shops on the Eastern side of the last named Court; access to the first was by a flight of 10 or 12 steps, this also giving access to the gallery of the Court, where from 100 to 200 persons crowded when any exciting trial was going on, or any election. The two dwelling houses were occupied by Rogers (shoemaker) and Mr. Dingley (grocer), and subsequently banker. These houses were purchased for the present Corn and Butter Market House (below), and a space given up of 20 odd feet on the West side, and 10 to 15 feet on the East side. The street at the back of the old Town Hall was widened when theses improvements were made; the street was called Back Street (I think in the old Borough Record it was “Pillory Row“). The streets of the town at this time were pitched, or paved with stone. This caused continuous noise by the wheel traffic passing over it. The town lighting was not very brilliant, about 20 to 25 oil lamps casting a feeble light. The means of locomotion were so different to what they are now that the young of the present day will smile at the difficulties their forefathers had to encounter. I do not remember more than two gigs of two wheels being kept by private individuals, and about the same number of family coaches. The White Hart Hotel and king’s Arms supplied yellow post chaises for any special occasions, and for the through traffic to and from London and Falmouth. The public conveyances were two only, the mail coach carrying the mails and four passengers inside, and the like number outside, the time occupied in reaching Exeter was 6 to 7 hours, and London 24 to 26 hours; this was continuous travelling, and stopping for hasty meals about three times. There was a daily coach from Exeter to Falmouth called the “Regulator,” this took about 14 hours in performing the journey, and carried 16 passengers. The Falmouth Packets were at this period in full working, and as the Continent of Europe supplied most of the correspondence of those days, whenever any disturbance occurred, and the Government were anxious for the earliest information, the important despatches were sent on by men on horseback, the bearer taking his timetable to the Post Office to have the hour recorded; while this was being done the next post-boy and horses were ready to go on. On one occasion (I don’t know why) 20 of these despatches passed through in one day. The goods traffic was limited in its quantity, and very expensive in point of charge. The direct and only through wagon to London was “Russells,” drawn by 6,8, and 10 horses. I really forget the time occupied by this conveyance. Large quantities of Spanish dollars passed by this vehicle to London; when this took place, a formidable-looking figure, muffled up with overcoats and capes, sat with blunderbuss in his arms, ready to give any assailant a war, reception. I remember when the only approach to the town from the East was by Angel Hill, and I can still see this waggon with 8 to 12 horses hauling up that steep gradient, the cumbrous vehicle so heavily laden with merchandise of all kinds. A local waggon took the journey to Exeter twice a week. This was set on the road, I have understood, by the manufacturers of yarn and other woollen products. This Exeter waggon (sic.) continued its journey to Camelford, and there met a similar vehicle from Wadebridge and the West. By this means the Launceston wholesale dealers in leather, groceries, wines and spirits had their goods transmitted to those towns. But the bulk of heavy goods was sent from London by sailing vessels and waggons twice or thrice a week to Plymouth, a van for passengers and light goods going alternate days. Local carriers from Kilkhampton passed once a week on Sundays, and returned on the Fridays. The Bude and Stratton vans ran two and sometimes three journeys a week. There was much heavy traffic from Bristol, via Bude, and in earlier times via Boscastle. Their small coasting vessels traded to Bristol, and also to Wales, for coal, the principal port for coals until the opening of the Bude Canal. Large quantities of coal were hauled from the quays on the Tamar, Morwellham, Newquay (near Morwellham), etc.. There are not many of the houses of this period remaining in the same condition as they were half a century ago. 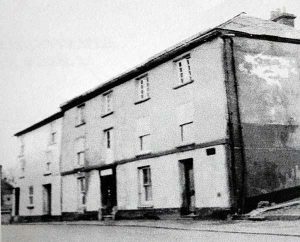 The house at the corner of High Street and Broad Street, now the receiving house for the L. and S. W. Railway, is the only one that I remember. There are others in Church Street, but almost all have been altered and modernised. I daresay if the history of many of the houses were known, they would be interesting. I should like to relate what I know of one house in Broad Street, in which I was born, as there is a little bit of romance connected with it. The house as I remember it (two doors East of the White Hart Hotel) was at one time the “Large House” of the town. It was built of freestone, very massive walls; a heavy iron railing once enclosed it, and this projected into the street many feet, but this was prior to my earliest days. Samuel Lyne, of Launceston, Esq. who died 31st July, 1737. She had three daughters – Elizabeth, Johan, and Penelope – all of whom were married, and whose deaths, with their ages, are recorded on this tomb. Whether they were happy or not I never heard. It is probable after her father’s death she removed to the family mansion. And they called the measure a Hockin. I may add that his Worship as one of the Aldermen could have qualified for his office in the way referred to in an earlier part of this paper. On goodly ground ’tis certain. No lectures of the curtain. A bell without a clapper.